"One of television's most imaginative film-makers has condemned Mark Thompson's leadership of the BBC as a 'catastrophe' and accused the corporation of undermining its worldwide reputation by insulting the intelligence of viewers. Tony Palmer, who has won more than 40 awards including Baftas, Emmys and, uniquely, the Prix Italia twice, criticised the director-general after the BBC turned down a documentary of his. The film, about English composer Ralph Vaughan Williams, has been produced by Five instead. Palmer said he received an extraordinary rejection letter from a BBC commissioning editor explaining that, 'having looked at our own activity via the lens of find, play & share', it had been decided the film did not fit with 'the new vision for [BBC] Vision'. Bizarrely, Palmer said, the letter concluded: 'But good luck with the project, and do let me know if Mr. V. Williams has an important premiere in the future as this findability might allow us to reconsider.' Vaughan Williams died in 1958." This story in today's Observer may help explain why I, and many others, are so critical of today's BBC. The fiftieth anniversary of the death of Ralph Vaughan Williams falls on August 26, 2008. I will be starting the celebrations on my Future Radio programme on Sunday January 6. Unlike the BBC I haven't looked for an important premiere by Mr. V. Williams. Instead, I'm making do with his overture The Wasps and 'Glorious John' Barbirolli's blazing account of RVW's magnificent Fifth Symphony - for me not just one of the composer's greatest works, but also one of the masterpieces of twentieth century music. Header photo was taken in better times at the BBC, when Michael Tippett's Second Symphony was being rehearsed at their Maida Vale studios. 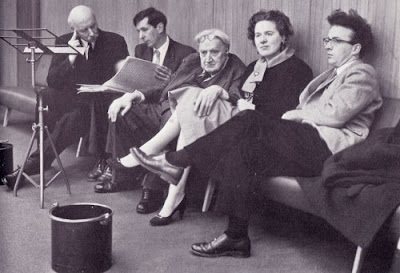 From left Sir Adrian Boult, Michael Tippett, RVW, Ursula VW and John Minchinton. More Vaughan Williams here. The BBC Radio 3 website has not carried one mention of the death of Karlheinz Stockhausen over the weekend. Typical of the way the Corporation has lost touch both with its listeners and reality. If people are really upset about the quality of the BBC today, I wonder what is was like in the past. It's still light-years ahead of anything I've heard on this side of the Atlantic. It must have been great. I was talking about the BBC Radio 3 website, not the news pages. If the music blogs can comment on Stockhausen's passing within hours, why can't the BBC's serious music channel? I would have been very surprised if BBC News hadn't covered the story. Although anything is possible these days. Sadly, I don't have any time for the 'It's still light-years ahead of anything I've heard on this side of the Atlantic' school of thinking. The decline in quality of the BBC in general, and Radio 3 in particular is a scandal. Irrespective of what goes on elsewhwere. That letter's clearly witless tosh of the worst kind, but I can't help thinking that the Observer's attack on the BBC's "ignorance" might carry more weight if it had been written by someone who knows what a symphony is. 'He approached the BBC last year with the idea of making a documentary about Vaughan Williams, whose best known symphonies include The Lark Ascending and Fantasia on Greensleeves, in time for the 50th anniversary of the composer's death. And as I've pointed out elsewhere, the Observer also managed to get the day of Stockhausen's death wrong. Geez, and I thought it was just on this side of the pond. It's a veritable 28 Days Later of music! Somedays I think it's just all over.